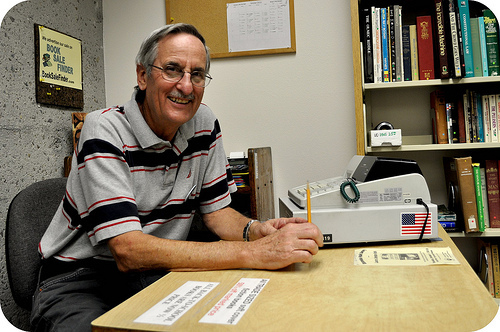 The Escondido Public Library has volunteers that work in all departments performing various tasks. Volunteers must be a minimum of 14 years old. PLEASE NOTE: The library does not accept any court-ordered community service. Desire to help the library and your community. Skills appropriate to the tasks assigned. Compliance with library rules, policies and procedures. Fingerprinting & background check required for all volunteers. Interview with the Volunteer Coordinator to make sure needs and goals are compatible. Library Materials Shelver- Adult Volunteers needed to shelve library materials. Must be able to alphabetize, understand numbers, be able to squat, bend, and reach overhead. Familiarity with the Dewey Decimal System preferred but not required. Tech Volunteer: Adult Services is looking for a very tech savvy volunteer willing to assist with our upcoming bi-monthly "Virtual Reality @ Your Library" program. Friends of the Library Volunteer- Adult volunteers needed to work in Friends Shop and workroom, selling books and media materials. Find out more. Literacy Tutor - Adult volunteers needed to teach other adults how to read. Find out more. Please contact us at 760-839-4819 if you're interested in volunteering. Are you a teen looking for ways to earn community service hours*? Review Crew - For every 3 qualifying book reviews earn 1 hour of community service. Teen Advisory Board - Become a member of Escondido Public Library's Teen Advisory Board! Reasons to join: Make new friends, earn community service hours, become involved with your community, plan teen programs, and participate in special events. Meetings are on the first Wednesday of every month from 3:30-5 p.m. in the Turrentine Room. *Participation in these two groups does not require fingerprinting and a background check.